Greece and China have dominated the financial news over the past few weeks. What is most interesting to me is not the actual crisis events, which were fairly obvious to see coming in advance, but the response to each crisis from their governments. When it became clear a few weeks ago the next deal between Greece and the European Union would be postponed at least a few weeks there was a quick and swift response; shut down the banks and shut down the stock market. In essence, your money was locked up and untouchable as a Greek citizen. I discussed the stupidity around having your money in a savings account to begin with last week, but (hopefully?) when the banks re-open after the next bailout is finalized everyone will immediately pull out every dollar they possibly can, right? We'll have to see. In China the story was different, but the similarities were striking. Their stock market experienced an incredible rise over the past twelve months fueled by speculation from individual citizens within their country. Small retail investors account for 85% of trading in Chinese stocks. There are 90 million of these retail investors and two thirds of them do not have a high school diploma. A large portion of the spectacular rise from stocks was fueled by margin, meaning money borrowed to purchase shares. 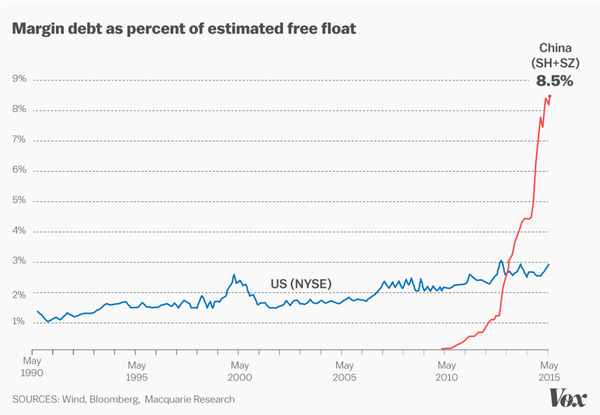 The chart below shows the record breaking margin debt in China as a percentage of the value of all their stocks. The total margin borrowing (equivalent to 8.5% of the entire market) is greater than any borrowing binge we have seen in any market in history. Bloomberg estimates there was another 3 trillion yuan borrowed in the shadow lending markets which would push the total to 22% of the entire market! What happens when 22% of the market is on margin and stocks are purchased by uneducated (mostly new) investors chasing hot money? 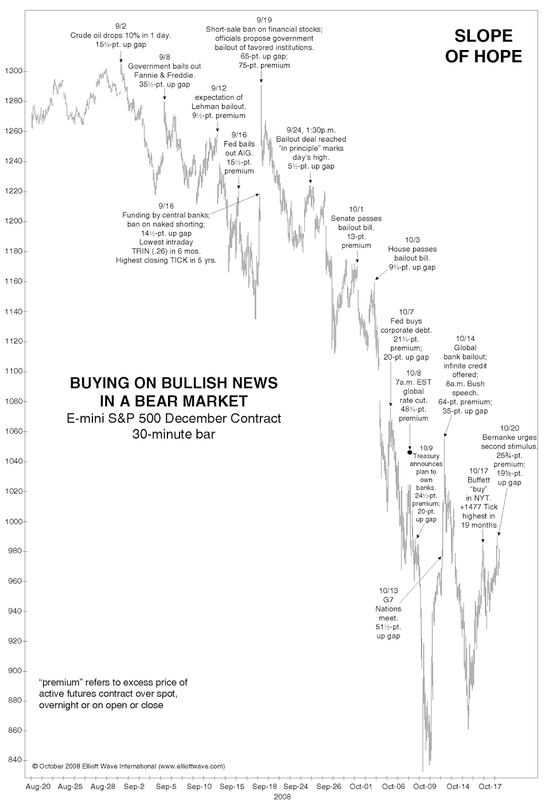 If stocks reverse course there is panic and liquidation, which is exactly what happened. Stocks fell 35% over 18 trading days, with many of the high flying names falling much further. 71% of the shares on the market were halted (meaning trading was shut off - just like in Greece). That is 1,331 companies, $2.6 trillion or 40% of the entire market cap. Their securities regulator then banned any shareholder owning more than 5% of a company from selling for 6 months! Corporate executives and directors were all banned from selling. China ordered government owned institutions to maintain or boost their stock holdings. 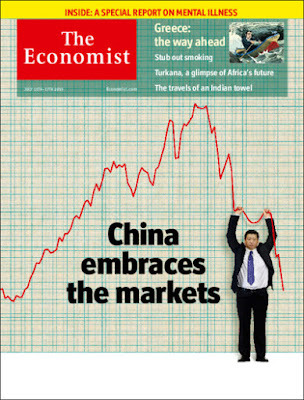 China restricted short selling in the futures market and then encouraged financial firms to purchase shares. Think about that last paragraph for just a moment. If you had money in the market you were essentially locked out from selling shares. Your money was trapped in the market like a bank shutting down their ATM machines. Then the government, almost overnight, put together a full blown program designed to halt shares from falling and push prices higher. The government became the stock market. The next logical step (if prices do not rise from here) is for the central bank to enter the market and begin printing money to purchase stocks directly. Sounds insane? Japan's central bank currently does it every month. Where will Chinese stocks go from here? Obviously, I have no idea. Just like almost every action we see by governments during each crisis around the world, the response is unprecedented. The most important part of each crisis was the initial response; turn off the markets and/or shut the doors and do not allow people to get their money. This should be an advance warning for investors around the world. As an individual living in China, when they turn the markets back on, wouldn't you sell as quickly as possible and stay away from the markets for good? This is the long term problem with government intervention into any market. They may be able to push markets higher in the short term but the unseen long term damage is always far greater.